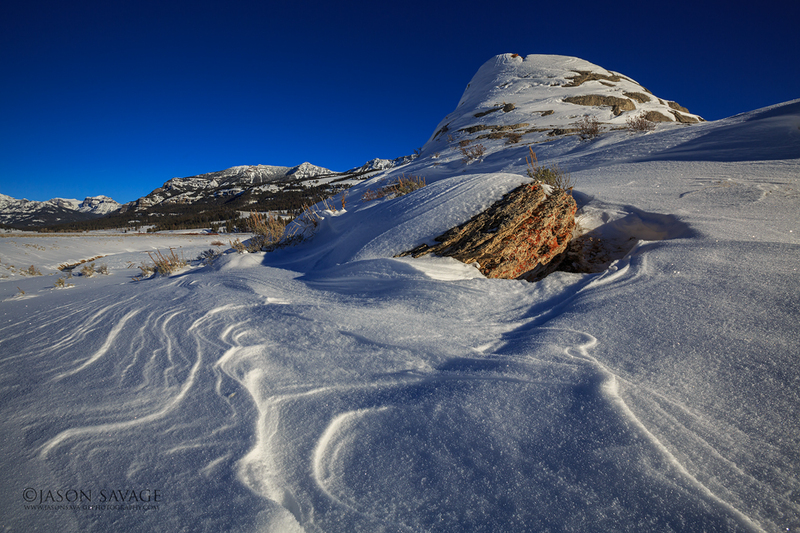 Here’s a recent shot of Soda Butte on a cold winter morning in the northeast corner of Yellowstone National Park. I loved the patterns and lines in the snow, and having a beautiful clear morning really helped. One thing I find myself doing more often now is shooting my wide angle without a tripod, especially when I have to get into some really weird or awkward position low to the ground. It feels like blasphemy to the landscape photographer within me to shoot without a tripod, but I’m finding with the increased high ISO noise performance in newer camera bodies, I’m able to shoot at ISO 800 and ISO1600 with very little noise. This allows a lot more freedom to experiment quickly with different angles, work faster , and a chance to get a shot that you might have otherwise missed when setting up a tripod. Not by any means am I saying not to use a tripod, but it’s those particular situations where I am working more frequently without one. I’m still blown away at the high ISO performance in the Canon 5D markIII and 1DX cameras and can’t wait to see how this continues to be pushed forward in newer technology.